Not only does the new 2017 Kia Forte sport a new powertrain, but it’s also stocked with a ton of new features inside the cabin. We’ll talk about some of the 2017 Kia Forte’s new interior features like Android Auto and Apple CarPlay. The 2017 Kia Forte is available in three trims: LX, S, and EX models. The new sporty Forte S and LX trim level will see upgraded cloth seating material, with the S trim featuring black cloth seats with contrasting white stitching, and a leather-wrapped steering wheel and shift knob. The EX model will now come standard with leather seats and heated front seat, dual-zone fully automatic temperature control, rear vents, and push-button start. The UVO35 telematics system, displayed on a 7-inch touch screen, will come standard on the S and EX trims. Which Forte models will have Apple CarPlay and Android Auto? Late availability of Apple CarPlay and Android Auto will also be found on the S and EX trims. 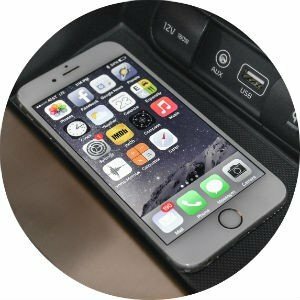 These infotainment systems will allow drivers to use many of the same apps on the 7-inch touchscreen display as they would in their compatible Apple or Android smartphone. Drivers will have access to dozens of popular apps that include messaging, maps, music, and more! Depending on which trim level you end up choosing, the 2017 Forte will come with Kia’s newest navigation system and Drive Mode System. Drivers will be able to choose between Normal, Eco, or Sport modes in the Forte. We can’t wait for the new 2017 Kia Forte to arrive here at Big Red Sports/Imports!